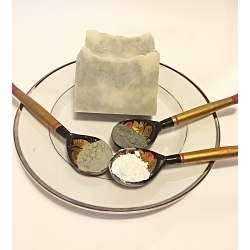 You save $2 buying charcoal/bentonite soap and facial mask together. 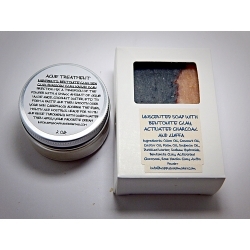 You will get 2oz of Acne Treatment facial dry mask and one 3.5-3.7 oz of Activated Charcoal/Bentonite clay soap. This is an effective anti aging face mask with antioxidants and beta carotene that regenerate skin cells and revitalize and firm skin. The beneficial properties of this mask are seemingly endless – the algae (Spirulina) deliver some of the sea’s most nutritive skin enhancing benefits. It has a high content of amino acids and it’s rich in vitamins and minerals. Spirulina is a type of oceanic algae that contains a wide array of nutrients. Known as one of the "super foods". Spirulina helps the formation of new cell membranes, eliminates toxins, helps store moisture and improve elasticity. Incredibly high in anti-oxidants. Contains amino acid methionine, vitamins C, B1, B5, B6, E, Beta-carotene, copper, manganese & zinc. This listing is for one 2-oz jar. WARNINGS: PERSONS WITH AN ALLERGY TO IODINE SHOULD AVOID USING THIS PRODUCT. 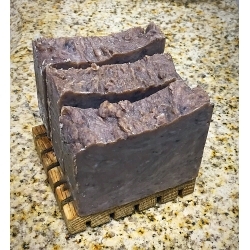 This Birch Tar soap with Rhassoul clay is MUST HAVE for those who have a problem skin. It helps to get rid of blackheads, heal or prevents acne and clogging of the pores. 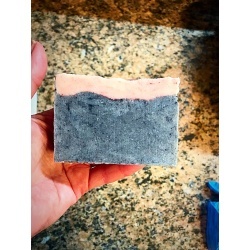 Birch Tar is a natural antiseptic; In addition, it increases blood flow to the skin, dry wounds, accelerating the processes of regeneration and removing pain. Acne, eczema, seborrhea, psoriasis and itchy skin have all been successfully treated with birch tar, and because of the naturally occurring salicylic acid and methyl salicylate (an organic ester) in birch tar, it acts as a natural exfoliator that sloughs off dead skin and tones new skin. This mask brightens skin and exfoliates dead skin cells revealing glowing new skin. 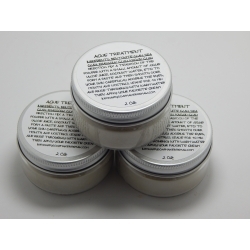 This is amazing for treating a dull complexion, aging skin and pigmentation. This facial mask helps to maintain the oiliness of the skin. - Pumkin powder is a rich source of antioxidants and enzymes that acts like alpha-hydroxy acids. Pumpkin also contains more than 100 beneficial nutrients, which may be used to help reverse the signs of aging. Pumkin is active enzymes provide a natural chemical exfoliation. Vitamin A and Vitamin C help soften and soothe the skin and boost collagen production to prevent the signs of aging. Zinc in pumkin seeds is great for acne sufferers. Pumkin seeds are high in essential fatty acids and vitamin E, which are necessary to maintain good barrier fuctin of the skin. 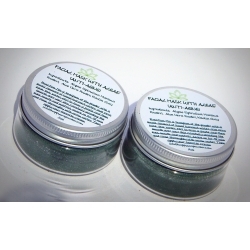 - Basil leaves are known to be very effective in fighting acne. Basil possesses antiseptic properties and hence, it can make your skin scar-free and glowing. Basil acts as a good cleanser for the skin. 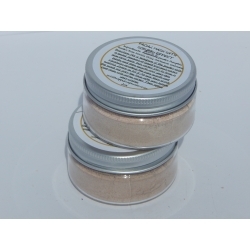 -Rose Kaolin Clay is an emollient, balances skin’s pH, refines skin texture & dehydrated skin. 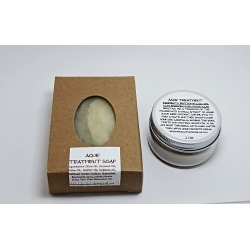 -Oatmeal Colloidal naturally moisturizes and creates a protective barrier on the skin. 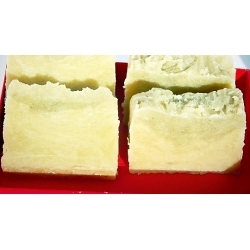 It also acts as a natural pore cleanser, and is soothing to sensitive skin. IF YOU ARE ALLERGIC TO GLUTEN YOU MIGHT HAVE A REACTION TO THE OATMEAL COLLOIDAL. Direction: Mix a teaspoon of the powder with a small amount of liquid (coconut water, aloe vera juice, tea, water, etc) to form a paste and then smooth over your skin carefully avoiding the eyes, mouth and nostrils. Leave on for 5-10 min then scrub the mask all over the face with your hands and rinse with warm water. Then apply your cream.